God makes beauty out ashes. Let this be your tangible reminder as you rise from the ashes of your life. Beauty will rise when we give our heart to the One who can mend it. God can take all our broken places and give us new life and hope and purpose. 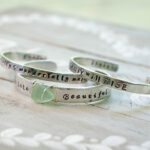 We pray this bracelet would be an encouragement as you take that step of faith in letting go and trusting God. 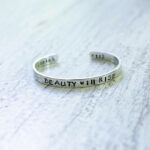 This bracelet is hand stamped on a silver cuff bracelet. Made from food safe aluminum, this cuff is a great option for those who have metal allergies and will not tarnish. Simply polish when needed.